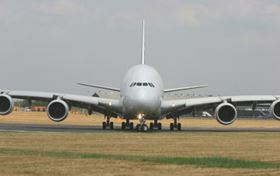 Engineers saved weight wherever possible to maximize payload capacity of the A380, the world's largest passenger aircraft. AMESim predictions of system performance matched bench tests of actual system behavior. LEHGS Freinage A380: Local Electro Hydraulic Generation System (LEHGS) with its Electronic Control Unit (ECU). In addition to emergency braking on all 20 wheels of the A380, the LEHGS also provides backup hydraulic power for the all-important nose wheel steering system. Size definitely matters, especially when you're developing the world's largest passenger jet. With an overall length of 73 m and a wingspan of nearly 80 m, the Airbus A380 provides seating for 525 passengers and a range of 15,200 km (more than 9,400 miles) – sufficient to fly non-stop from New York to Hong Kong. To gain maximum fuel efficiency and payload capacity, weight saving was a must when developing this massive plane. Composites and other lightweight materials account for more than 25% of its structure, and engineers scrutinized every aspect of the aircraft to further trim it down. Of particular interest were heavy hydraulic lines running the length of the aircraft from large centralized pumps to equipment, such as brakes, landing gears and the nose wheel steering system. Ordinarily, large commercial jets have three sets of redundant hydraulics: two primary circuits and a third back-up for safety, all adding up to a big load of hefty piping. To reduce this bulk, Meissier-Bugatti used LMS Imagine.Lab AMESim and the Ground Loads solution to replace the A380's all-hydraulic backup circuit with a decentralized fluid-power generation system. Signals from electronic control units (ECU) activate multiple small electrically-driven micro-pumps, each located close to the systems to be controlled. The micro-pumps provide 5,000 psi (350 bar) of local hydraulic pressure over short runs of small-diameter lightweight piping for braking and steering, so it's always available in an emergency. 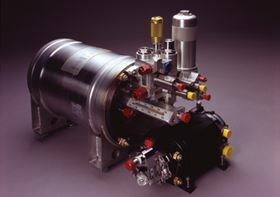 A world's first in a commercial airliner, this Local Electrical Hydraulic Generation System (LEHGS) was developed by Messier-Bugatti, a subsidiary of the SAFRAN Group. An Airbus partner for over 30 years, the company's customers include 250 airlines, 20 military air forces and major global aircraft manufacturers. In optimizing system performance, the engineering team on this project faced major challenges in integrating and sizing the large number of different physical parts, assemblies and subsystems for the mechanical, electrical and hydraulic systems. Moreover, they needed to assess any risk factors such as electrical overheating. Compounding the difficulty were demanding deadlines and budgetary constraints, which prohibited numerous time-consuming and costly physical tests of system mock-ups. Instead, work in designing and optimizing the performance of this first-ever system would have to be done early in the plane's development – before any hardware was built and at the same time as the design of other aircraft systems was underway. Messier-Bugatti met these challenges with the LMS Imagine.Lab Ground Loads solution, based on the AMESim simulation platform, which the company had implemented on previous projects for predicting the behavior of complex multi-domain intelligent systems. Engineers began by selecting and piecing together individual components and subsystems from among a library of pre-defined items: Hydraulic Resistance, Hydraulic Component Design, Electromechanical, Electric Motors and Drives, Thermal Resistance, Thermal Hydraulics and Electrical Basics. Unlike a conventional system modeling languages which require computer programmers to write software, the overall system model is created graphically in LMS Imagine.Lab AMESim, where engineers are prompted to enter parameters where necessary. In this way, the software creates a multi-domain system model from the overall conceptual information of interconnected parts and subsystems without requiring a full 3D geometry representation, so engineers can simulate and predict the behavior of intelligent systems long before detailed CAD geometry becomes available. Throughout this process, Messier-Bugatti system engineers took advantage of convenient and cost-effective access to the LMS Imagine.Lab Ground Loads solution thanks to the system's flexible licensing arrangement, enabling them to optimize the use of specific modules and libraries while lowering overall system simulation expenses. The LMS Imagine.Lab Ground Loads solution modeling and analysis capabilities allowed Messier-Bugatti to analyze system's hydraulic behavior in terms of performance, stability and robustness. Engineers also used the model to study the thermal characteristics of the hydraulic circuit and evaluate the need for heat exchangers. These results were then used to establish the sizing, output and other product specifications for the entire hydraulic power generation system including the tank, pump and accumulator. By using the LMS Imagine.Lab Ground Loads solution, engineers were also able to explore a large set of parameters and scenarios. When developing a steering system, for example, various combinations of components and systems (actuators, motors, valves, ECU, etc.) could be compared from specification to validation, thus significantly improving the steering system quality. With these predictive capabilities, Messier-Bugatti simulated the behavior of the electro-hydraulic system for the A380, validated system power-generating performance and enabled engineers to accurately size components early in development. This significantly reduced dependency on numerous physical prototypes. “Messier-Bugatti is capable with LMS Imagine.Lab AMESim to tune complex multi-physics systems without performing a large set of tests on bench,” commented Michael Benmoussa, senior design engineer on the project. 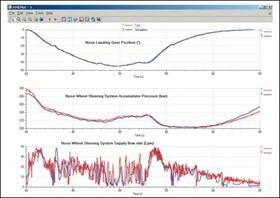 “Simulation enabled us to anticipate and reduce the inherent development risks of a new technology by incorporating an upstream validation regarding the technical choices,” he noted. “Simulation results obtained in the early project stages using LMS Imagine.Lab AMESim were later confirmed on test benches with a very good accuracy”.